Hopefully you all have had enjoyable and stress-free holidays and ready to rock in 2012!!! I wish you a great New Year. so cute, thanks for the freebie! Thanks for the heart borders! So good to see you are semi back. You've been missed. I hope you had a wonderful holiday and wish you the best in 2012. Thank you so much for your shares! Thank you so much for this post. 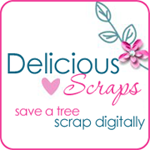 I want to let you know that I posted a link to your blog in CBH Digital Scrapbooking Freebies, under the Page 1 post on Jan. 09, 2012. Thanks again. love this doodled border! Perfect! Thanks so much!